Create unique personalised custom confetti | Printfetti - Your photos on confetti! 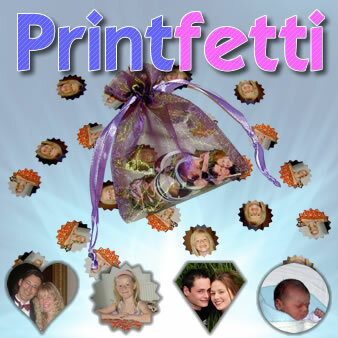 For weddings, birthdays, anniversaries, Christenings, in fact for any celebration, Printfetti provides that extra something that makes your party table that little bit more special. Your personalised table confetti will be sure to get your guests talking. 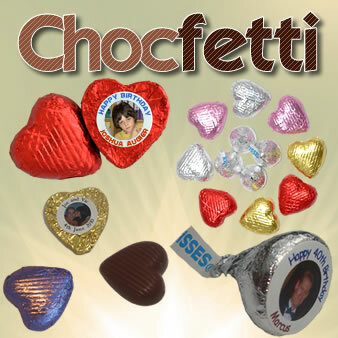 For even more of a `Wow` factor why not add some Chocfetti , chocolate with your very own picture on, everyone's favourite party favour. "Quality of product is great, delivery was very fast. I have deducted one star because the confetti was very expensive and I don't think 250 confetti will stretch very far!" "Absolutely amazing!! photo quality is superb. They will look great at our wedding!!" "Fantastic - I am highly delighted with the goods delivered and I certainly will be using the your site again." "Yet again, superb service. Thanks, I am delighted with my sons photo confetti." "Fantastic and unique. Absolutely delighted with the ease of the whole transaction"